Apparently no one told Rupert Murdoch that the recession is over. 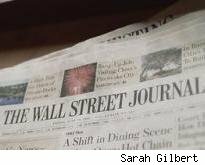 Murdoch's Wall Street Journal (NWS) is closing its Boston bureau, according to a memo sent out Thursday by managing editor Robert Thomson. "The economic background to the closure is painfully obvious to us all," wrote Thomson, adding that the nine reporters who worked in the bureau "will certainly be able to apply for openings elsewhere on the paper." The last layoffs at the Journal took place in February, when the paper eliminated 14 newsroom positions. So far, it has avoided making deeper cuts of the sort that have afflicted most large U.S. newspapers, including The New York Times, which recently announced its second wave of newsroom downsizing. In related news, Forbes is closing its Los Angeles bureau, and possibly the one in London as well, amid a round of cost-cutting that's expected to claim around 100 jobs total.